Jane Burkinshaws’s recent blog posts about photographing trees and leaves encouraged me to get outside and experiment a bit this weekend. There are many beautiful deciduous trees with good autumn colour and the Katsura tree is one of my favourites. At Sampston Hall a group of Katsura trees just beginning to lose their fresh green summer foliage caught my eye. There’s a clue in the Latin name. Katsura trees otherwise known as Cercidiphyllum japonicum originate from the Himalayas… China and Japan. They look delicate but are quite robust and hardy to about -15C. They can easily handle our mild British winters. 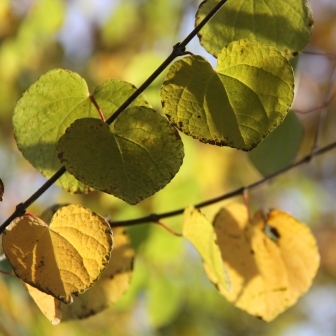 Heart shaped leaves turn a lovely soft caramel yellow in autumn. The dry fallen leaves actually smell of caramel, candy floss or burnt sugar too. 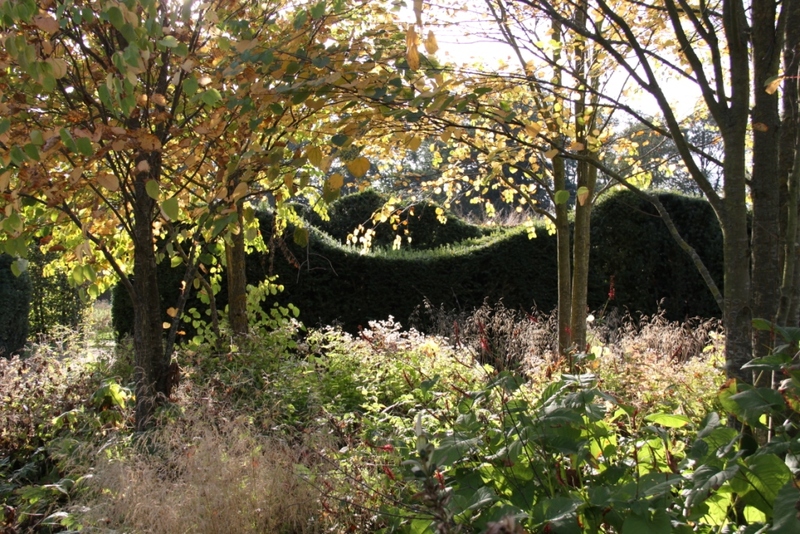 Here inside the Walled Garden at Scampston Hall this grove of Katsura trees are under-planted with broad leaved shade tolerant plants such as persicaria, geraniums and some beautiful grasses. If you are looking for quick results, Katsura trees grow fast and are low maintenance too. They like moisture retentive soils and will grow in most gardens. For country gardens I prefer the multi-stemmed trees which spread almost as wide as they grow tall. They have a light leafy canopy with bronze red leaves in spring turning a lovely fresh shade of green in summer then this beautiful golden yellow in autumn. Which is your favourite tree for autumn colour? Lovely colours. Thanks for the info – I didn’t know the name of that tree, though the leaves are quite distinctive and I am sure I have seen them somewhere before.